You won't get stuck with basic equipment in Skyward Sword, not if you've got the money and materials to make in better. If there's one thing that the Legend of Zelda games are known for, it's having lots and lots of items. Link's pockets are usually stuffed full of boomerangs, bombs, bows, and more besides. But for Skyward Sword, Nintendo has decided that simply having a lot of gear isn't enough, and has included an upgrade system to make your equipment even more effective. Speaking to GameSpot, Nintendo's Bill Trinen used the example of Link's shield. 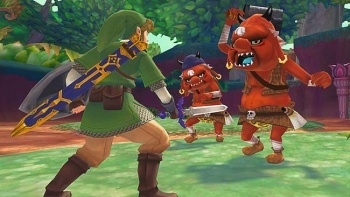 Early on in the game, he said, Link's shield was pretty basic thing - as it always is - but over the course of the game Link would be able to harvest materials from fallen enemies, which the player could use to improve the shield. He said that this was also true of Link's flying beetle device, as well as other, currently unspecified items. It seems a pretty safe bet that series stalwarts like the boomerang will also be upgradable, although Nintendo may yet surprise us. Technically, this isn't the first time that items have been upgradeable in a Legend of Zelda game; A Link to the Past, for example, had blacksmiths who could upgrade your sword, and a hidden magical fairy pond that would upgrade your boomerang and your bow. It's also not uncommon to find new and improved versions of certain items in Zelda games, such as Biggorran's Sword in Ocarina of Time, wich was an upgraded version of the Giant's Knife. However, a system where the player has to collect materials and cash to make the improvements is something quite new for the series, and could be rather interesting.